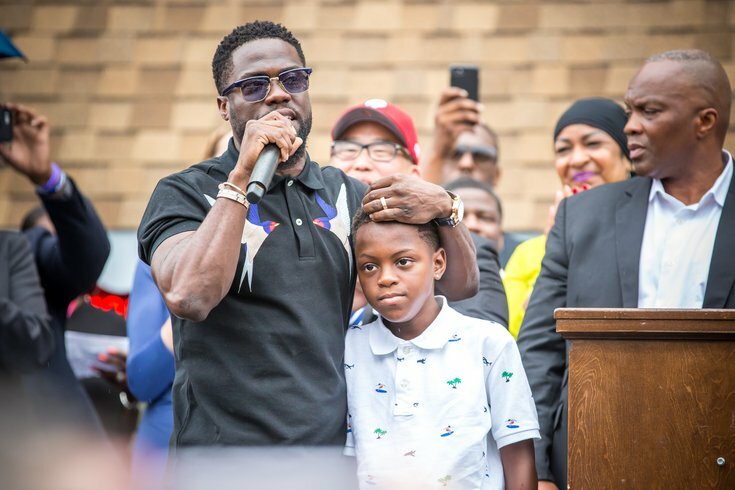 Actor Kevin Hart stands with his son Hendrix during the 'Kevin Hart Day' event in Philadelphia on July 6, 2017. North Philly native and comedy megastar Kevin Hart was on top of the world at the start of 2017: recently remarried, first-time author, third kid on the way and an unstoppable brand with countless movies, endorsements, ventures, appearances and general clout. Then came the summer and Hart screwed it all up by cheating on his wife, Eniko Parrish, in at least two reported instances in Miami and Las Vegas. The fallout was scandalously public, with videos posted online and an ongoing extortion investigation that authorities say involved an attempt to squeeze seven figures out of Hart to keep the tape a secret. For the most part, the "Jumanji" star has been forthright about his transgressions in the months since the scandal broke. He named his "Irresponsible" comedy tour in reference to his wrongdoing and recently hosted "Saturday Night Live" without skipping a beat. But for the first time earlier this month, Hart fielded direct and personal questions about his state of mind, the lessons he's learned, what it means to accept responsibility for a betrayal, and his luck in keeping his marriage alive. "This is wrong because I had what I wanted," Hart said. "I had what I wanted and a foundation at home, and a family, and a comfort zone. I worked so hard to get here. I built this brand. We sit on the fruits of my labor. 'Oh, my God, I'm as happy as I want.' What the f*** am I doing?" The comedian talked openly with the hosts of Power 101.5's "Breakfast Club," explaining that the incident in Las Vegas was prompted by a spontaneous trip when his planned appearance in Barcelona was canceled due to a terrorist attack. Hart doesn't exactly make excuses for himself. He owns it all and admits things are still uneasy at home. If he can be faulted for anything here, guilt aside, it's that he conveniently adopts an outcome-dependent attitude toward behavior everyone knows is the single-worst violation of trust in monogamous relationships. "That's Kevin Hart in his dumbest moment," Hart said. "That's not the finest hour of my life. With that being said, you make your bed, you lay in it, okay? So you can't even say, 'What were you thinking?' Because you weren't thinking. You can't say, 'Kev, what were you thinking when you did it?' That's where the false reality comes into a f*** up. You don't plan to f*** up. You f*** up, and then you go, 'Oh, s***, I f***** up." Given the dreadful statistics on infidelity in the United States, the entire discussion is worth a listen for anyone interested in relationships, celebrity and Hart's perspective on the life lessons he'll take from this experience. Judging by what Hart didn't say, it sounds as if there will be another big shoe to drop on the legal side of this scandal. "I can't even get into the f***** up status behind the whole thing," Hart said. "It's a real federal investigation. Like I said, regardless of that, I'm not even going to throw it to that. I'm wrong ... But the levels of s*** that will come out, people are going to be like, 'Oh...oh, s***."